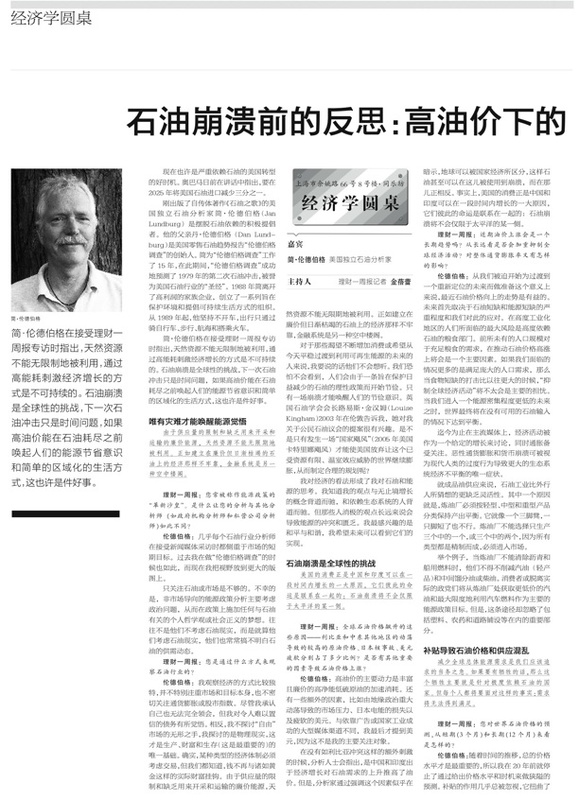 In Jan Lundberg's interview with Oriental Morning Post - Weekly Edition, he told this reporter that petrocollapse is a global challenge and the next oil shock is just a matter of time. People need to be aware of this and start to live a simple, energy-wise and localized life before it's too late. Jan Lundberg is an independent oil analyst who just published his autobiographical Songs of Petroleum. His father Dan Lundberg was the founder of the Bible of the oil industry "Lundberg Survey." Jan worked closely with Dan Lundberg for 15 years, during which time they accurately predicted the Second Oil Shock in 1979. In 1988 Jan had left for-profit work and founded Fossil Fuels Policy Action which coordinated the Alliance for a Paving Moratorium and published the Auto-Free Times magazine. Jan has been car free since 1989 and enjoys bicycling, walking, sailing, and taking trains. 1. You have often been referred to as the “progressive czar” of energy policy. What makes your analyses different from that of other analysts? Most every oil industry analyst quoted in the news media focuses on short-term market objectives. This is what I used to do at Lundberg Survey when we were known as the "bible of the oil industry" in the U.S. I now incorporate the big picture when I think, write, speak and even sing. But it is not enough to look beyond oil or the marketplace. Unfortunately, the non-market oriented energy policy analysts primarily consider political issues, thereby imposing their personal philosophies or social-justice dreams on any oil-related outlook. More often than not they do not consider oil realities, or if they do, they often do not understand oil supply dynamics. 2. How do you look at economics and the oil industry? I explore what are the physical realities, not the hands of the "free" market, that are the only basis of production, wealth and (most importantly) survival. It's true that an economic system of some kind must take care of exchange. But we all know that money is no longer anchored to actual wealth such as gold. Natural resources cannot be exploited indefinitely due to limits in supply and lack of cheap energy to extract and transport them. The financial system is a house of cards similar to how the economy is a house of cards based on cheap but now depleted oil. I tell people what they don't want to hear, if they long for rising consumption or if they expect a smooth transition to a renewable energy future. Austerity will come from collapse, probably not from an intelligent policy of rationing to conserve dwindling oil. The head of the Institute of Petroleum, Louise Kingham, told me in London in 2003 that she was taken with my proposal for Citizen Petroleum Councils. Will there have to be "a national Katrina (hurricane of 2005)" for any sensible planning in the U.S. that isn't about expansion in our resource-constrained, greenhouse-warmed world? My view of economics shapes my thinking about oil and energy. I realize that my views run counter to the notions of endless growth and separation of people from the ecosystem. Those illusions contribute to strife and deprivation in the long run. I'm most interested in peace and harmony, and can actually anticipate more of it globally some day. 3. In terms of the recent spike in worldwide oil prices, approximately what percent of the increase is due to 1) higher crude oil prices amid unrest in Libya and elsewhere in the Middle East, 2) the Japanese nuclear disaster and 3) the weaker U.S. dollar? Are there other important drivers to the run-up in oil prices? The main driver of high oil prices -- in our place in history which is on peak oil's brief plateau -- is the accelerating loss of abundant, cheap, high-net energy, sweet crude. There are additional factors such as market pressure brought about by geopolitically significant unrest, Japan's loss of electric power capacity, and the weaker U.S. dollar. I mention the dollar last because it is not my main concern, in contrast with the large media outlets that depend on advertising or national industrial success. At certain times, when there is no additional stimulus for prices such as the Libya conflict, analysts point out that rising demand in China and India for oil, as a function of economic growth, pushes oil prices higher. But by emphasizing this factor, analysts seem to imply that the globe can be separated by national economies, such that oil can even collapse in use here and do the opposite over there. In truth, U.S. consumption is a big reason China and India have been able to grow for a time, and the fortunes are linked: Petrocollapse will not be limited to one side of the Pacific. 4. Will the recent spike in oil prices be long-lived? Will it serve to meaningfully dampen worldwide economic activity? Impact on overall inflation rates? The recent oil price trend upward is salutary in the sense that we are forced to start preparing for a a transition to a relocalized future. The future hinges first on the severity and response to oil shortage and energy shortage. The biggest risk we in very industrialized regions face is in the food sector that is so dependent on petroleum. The need for enough food for unprecedented population sizes will be a major factor in keeping petroleum prices high. When food shortage hits harder than ever, "dampening worldwide economic activity" will not strictly be the main concern, if conditions are more about meeting basic human needs for a huge population. Eventually, equilibrium will be reached without available petroleum inputs, as we enter a much less energy-intensive future. Economic activity has been heretofore discussed in mainstream media in terms of growth as a given, with much concern for inflation. Hyperinflation or currency collapse can be thought of as only symptoms of the way the greater ecosystem's economy has been imbalanced by the excesses of modern humanity. One reason the oil industry is less flexible than outsiders assume, in terms of supplying refined products, is that refineries must adhere to a balance of output by type: light, medium and heavy products. It is like a three legged stool that cannot have just one leg shortened. A refinery cannot choose to just make one of those three, or just two of those three, because all types result from refining and must enter the market. When refineries cannot get rid of asphalt and bunker fuel, for example, they have to cut back on gasoline (light product) and middle distillate or diesel. If consumers or policy wonks think they can call for just gasoline from a refiner, to maximize fuel for cars while no longer calling forth plastics, pesticides, road surfacing, etc., they won't be satisfied. So we can see that refineries can be forced to cut back on crude oil input due to imbalance. It is also important to realize that refineries need to operate at relatively high utilization of capacity except when shut down for maintenance. 5. What are your projections for world oil prices over the short-run (3 months) and long-run (12+ months)? The general price level over time is what's important, so I stopped over two decades ago making narrow predictions by identifying a price level and timing. Almost always overlooked is the role of subsidies, which distort prices and can lead to upsets in price and therefore supply. In the U.S., for example, historically low prices for petroleum products were possible by many subsidies (direct and hidden) accounting for several dollars' per gallon suppression. The nominal price below five dollars retail per gallon today may be only a third of the true cost -- but not even including environmental and health cost -- according to an analysis by the International Center for Technology Assessment in Washington, D.C. Having said that, I believe that only unprecedented high prices for oil will start serious conservation (or hoarding) and adapting to the post-petroleum future. I would not be surprised at $200 per barrel crude, or even higher, in the next year or two. But it will be fairly short-lived because of demand-destruction and a trend to move onward to localized, simpler living, out of necessity. 6. You recently said that most worldwide residents have been propagandized to believe that they need energy in such quantities and forms that nuclear and coal must be tolerated and pursued. You noted that questioning this supposed need for massive quantities of energy “leads one to notice overpopulation as well as the lifestyle of accumulating more and more material things.” Against that backdrop, what are the short- and long-run solutions to the world’s great reliance on energy? Ultimately, we need to think of energy as a natural part of life, obtained in various guises, instead of a sector independent of or above our energy-laden food, shelter and clothing. Until society regains its balance in harmony with nature -- a harder transition to manage when we have degraded the environment -- there are only solutions for local-based problems. This is good news, for example when renewable energy is efficiently obtained and distributed in a decentralized fashion. But it's bad news when there has to be a global response to a problem such as the Fukushima catastrophe. As for peak oil or petrocollapse, they are intractable at this point; a dilemma that cannot be solved. There will be work-arounds for survival. Thriving will be in a different way. One does not have to worry so much about energy supply constraints when one is, for example, Bolivian. In Bolivia, 80% of the people are not petroleum dependent, according to a high official I spoke to at the Cochabamba climate summit last year. 7. Is the ultimate solution to the energy crisis to decrease worldwide demand for energy of all types? If so, what are some practical methods nations can take to achieve this? Suggestions for individuals? Yes, decreasing demand worldwide for energy in general is the top priority we should all pursue. The sacrifice if there is one should be mostly for the extremely petroleum dependent nations, but everyone will have to face that demand will not being met. This is only a problem until petroleum is basically history. I disagree with the idea of Hubbert's peak oil curve featuring a gradual downslope. Regardless, the idea of energy curtailment is not always in sync with the statements or purposes of those convincingly promoting alternative forms of energy. So, many people by default wait for a so-called green-energy future (somehow without the failure of the oil-oriented infrastructure). Practical methods for nations to decrease demand for oil include the removal of subsidies, increasing taxes, and discouraging consumption through rationing as well. This sounds anathema to many who count on growth, but we must anticipate objectively what is likely to happen, rather than mainly wish for or fear a particular outcome. 8. What is your view of so-called green energy alternatives? Green energy is a relative concept. Passive solar is simple, productive and inexpensive. In contrast, "a clean car" is an oxymoron, mainly because a huge portion of the air pollution associated with the car is NOT out of the tailpipe. Some diesel cars have successfully adopted veggie oil instead of burning refined crude oil, on a very limited basis because of quantities to be obtained mainly at restaurants. The supply of biodiesel however, has gotten tighter in California due to its recent cheaper-then-petroleum price, causing a run on the biodiesel. So the price has to be raised further for biodiesel, just so supply does not quickly dry up. Non-petroleum forms of energy are generally not nearly as high in net energy-yield (after extraction cost) as the old cheap oil was. Also, alternatives usually produce electricity only, instead of liquid fuels or materials such as plastic. Petroleum has been so cheap that it displaced everything from wood furniture to natural-fiber shopping bags and baskets. It is commendable that China took action to halt the massive waste of toxic plastic bags. When it comes to energy-source priorities, the first is conservation, the faster and deeper the better -- to minimize pain in future. The Second priority is conversion to greener energy, but we will all find that it cannot replace cheap petroleum. 9. Are there certain nations that are on the “right path” to energy independence? If so, which ones and how so? Which nations are clearly on the “wrong path” and how so? Can those nations on the “wrong path” use the “right path” nations as role models to achieve a higher level of energy independence? In addition to nations being on a path, we must imagine much smaller communities' paths. They will be linked in future by sailing ships, albeit for smaller quantities of goods. After all, modern cargo ships have slowed down on average to a 19th century speed of 15 knots, given the cost of oil. For now, as the global economy is still very much intact, Cuba is interesting for its adapting to its own petrocollapse brought about by the loss of Soviet oil: Local food capacity, using organic methods, grew and entered urban neighborhoods on a large scale. Bicycles became immensely popular, and solar panels helped remote areas keep lights on. How any country does well in an oil-constrained future depends in large part on community cohesion. Not merely coincidental with closer solidarity is that waste is less common where oil consumption is low and families and communities retain healthy traditions. It is obvious to the world that the U.S. is tragically in the wrong-path category, and it is not lost on the average person anywhere outside the U.S. that obesity, wars concerning oil and lack of good train infrastructure contribute to U.S. overall failure that the rest of the world has to suffer from. Fortunately there are constructive, positive elements in civil society and in every neighborhood that will bring people together again to help one another be realistic global members of humanity. Meanwhile, in the U.S. the military budget is the sacred cow for the two-party political system. When just over 50% of all tax revenues are devoted to arms and weapons research, as well as pensions for retired military people, this constrains terribly the ability of the nation to provide for its citizens or transform the oil-based infrastructure to more sustainable systems. As the military budget and U.S. wars bleed the nation and diminish U.S. prestige and credibility both inside and outside the U.S., the corruption and mislaid priorities will continue to afflict Americans and the planet until there is no longer enough money or oil to maintain the wasteful military. The public doesn't yet demand slashing the military budget, but we will all see a cutback in military operations when the world oil industry cannot get past a supply crunch that paralyzes most economic activity. Some believe oil supply will always be available for the military and rich individuals post-collapse, but this unrealistically implies a disjointed, mini-oil industry with full integration and no growth. 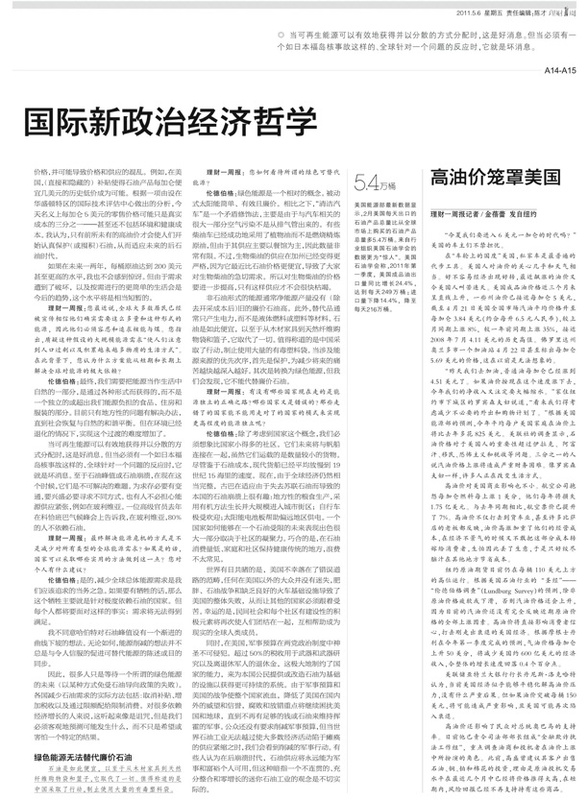 Print version of the two pages' images is at bottom. Photo credit: Constantina LoPresti of Berkeley, California. JL told Ms. Jin he had not heard the "progressive czar" label. For those individuals consuming more than the world average -- let us hope most know who they are and that they have some awareness on energy -- they should question sooner rather than later what can be cut back. Some measures are done more easily and quickly than other steps. Higher prices help a lot, but that is involuntary. So if one thinks he or she can afford the high consumption life, using many appliances and wasting automobile trips that could be eliminated, such a person should imagine rapid change that hits unexpectedly. One's ecological footprint takes into account such matters as the origin of food. One can not only buy local produce and bring it home by bicycle or bike cart, but encourage the store or farmers market stall to use pedal power and even sail transport. These steps get into activism just by starting important conversations and imagining a more efficient, less violent future. Little things one can do involve cooking vegetables less, eating them raw, or turning off the stove prior to the food's final stage of cooking -- letting the covered pot continue to cook the food slowly but surely for a few more minutes. Refrigeration is often not needed, but when people are worried about food supply in an uncertain world, they may want a large freezer full of food. This not only uses energy but may fail when power is cut back or altogether gone. Local food sources solve this to a great extent, but one needs to be involved such as turning lawns, parking lots and driveways into productive gardens. Obvious energy curtailment measures include using fewer lights and of lower wattage. Energy efficiency through renewable energy can mean a modest solar panel system that does not allow for many (unnecessary) appliances. Smaller houses, better insulation, living near one's work or working in one's home or neighborhood -- these help save nonrenewable energy and materials, save money, and prepare for a future dealing with natural limits. One needs to think proactively, independently, and collaborate primarily with others of like mind if possible. It is unfortunate that this sound discussion of what is likely to happen in the future is tainted by two misleading factors. It is common to convey the view that the operation of the systems of civilization is governed by the flow of energy. Energy flow is a necessary but not sufficient condition for the operation of systems which are made out of materials and suffer from wear and tear due to the continual operation of natural forces, such as friction. Some of the material consequences are mentioned but the focus on energy makes the discussion misleading. It is ironical that the central issue is stated to be 'petro collapse' when the article presents arguments for a gradual adaptation for an affluent society to make do with less stuff as well as cutting back on the use of energy. The term collapse carries the implication that this decline in natural capital will happen suddenly and unexpectedly when it has been under way in some Western countries for years and will slowly trickle down and out in coming years. Many readers will think the article is suggesting something similar to the recent stock market financial collapse in Western countries whereas the article is dealing with the operation of tangible materialistic systems. Denis, the public must appreciate limits on energy, and when it is petroleum there are crucial materials involved as well as energy. Promoting an awakening on this issue, as it relates to several other issues such as how people live as isolated consumers, is healthy. While it is true that modern civilization has been undermining itself for a long time, and a stock market collapse may not be much of an equivalent, the interviewer pointed out at the outset that "the next oil shock is just a matter of time." You don't seem to see as possible a sudden "decline in natural capital," however, there can be sudden manifestations acting like tipping points. Dependence on the oil market for supply means huge vulnerability. Your phrase "gradual adaptation for an affluent society" is not something I say is an option, particularly under conditions of peak oil and overpopulation. To build enough nuclear power plants to replace the energy used by fossil fuels would take massive amounts of fossil fuel and a major redirect of the global economy at a time when resources are shrinking. You would also have to replace the entire world's fleet of cars, trucks, tractors, and machinery with electric vehicles or some other alternative. Not only is this not possible, but even if it were, you would then have the entire world economy dependent on nuclear materials such as plutonium and uranium which are also ultimately nonrenewable. Not to mention the waste issue, the possibility of accidents and that you will be maintaining a system that is by it's very nature destroying the planet.